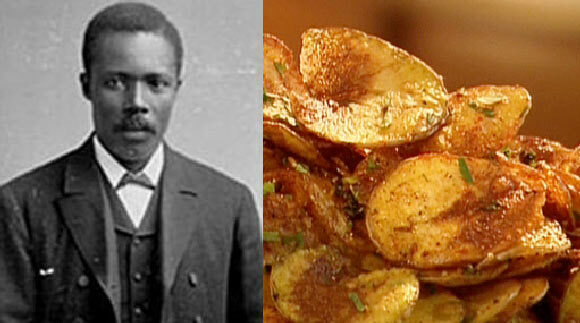 George Crum was an American native, widely credited with the invention of the first potato chips. Crum’s birth name was George Speck and he was born in New York in 1822 to Abraham and Catherine Speck. Abraham was African American whereas Catherine was an indigenous American belonging to the Huron race, so George was of mixed race. He also had a sister named Katie, who popularly came to be known as “Aunt Katie”. George later adopted his father’s racing name and called himself George Crum. As a youth, he worked as a wild animal trapper as well as a guide working at the Adirondack Mountains. Crum discovered his passion and talent for cooking and soon began working as a chef at the Moon’s Lake House restaurant at the Saratoga Lakes Resort. He became a well respected chef and in 1860, he quit his job at the resort to open up his own lakeside restaurant called “Crum’s House” in Malta, near Saratoga Springs, New York. The story about Crum being the inventor of the potato chip is widely believed but may not be necessarily true. Potato chips did already exist at that time, albeit in a different form, usually as sliced potatoes cooked in hot oil and seasoned with salt. This fact can be readily verified by referring to the existing cook books at the time. There are different versions of the story of how potato chips came to be invented. According to one source, it is said that one day while Crum was working in the kitchen of the restaurant at Moon’s Lake House, he received a complaint from a customer about the potato slices he had been served being too think and soft. Crum was not a patient or humble person, and wanted to reproach the customer for sending a complaint. He therefore cut the potatoes into slices as thin as possible and then deep fried them to a crisp, added salt and had them served to the customer. He expected the man to be annoyed but instead was surprised when he seemed to find it delicious, and finished the whole plate. Some sources say that the customer in question was a wealthy and successful railway businessman named Commodore Cornelius Vanderbilt, but this cannot been confirmed. According to another version, it was Crum’s sister Katie who accidentally discovered the potato chip. Katie also worked at the kitchen at Moon’s Lake House where Crum worked. One day while she was working in the kitchen, a slice of potato fell into the fryer and was fried to a crisp. Crum then came into the kitchen and tasted this accidentally burnt over fried slice of potato. He thought it was delicious and asked his sister how she made it, upon which she told him that it was an accident. Her contribution to the invention of the potato chip was even mentioned in her obituary in 1917. In any case, the chip was invented about this time and once Crum opened up his own restaurant, these chips were a regular feature there. They were served at every table and were originally known as “Saratoga chips”. He never patented his invention, though, and there is no documentation to support the claim that Crum was the original inventor which is why there is a doubt surrounding the issue. However, popular folklore attributes the invention to George Crum, and so his name will forever be included in history as the inventor of the most widely consumed and best selling snack of all time.